Derek Jeter is a name that resounds to any American sports lover including those who are not fans of the New York Yankees, the franchise he played for throughout his career. After about two decades in the Major League Baseball, Jeter brought his career to an end in 2014. He was a 14-time All-Star and a 5-time World Series champion. Jeter also won the prestigious Silver Slugger Award five times and was named the World Series MVP in 2000. As an honorable reward for his selfless dedication to the team, Derek’s number 2 was retired in 2017. 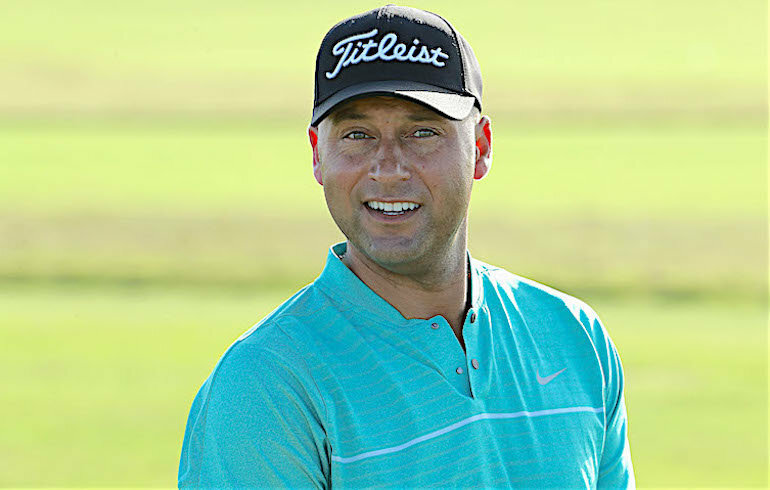 Since his retirement, Derek Jeter has remained active in baseball turning his focus towards the business side of the sports. He is the Chief Executive officer of the Miami Marlins. On the 26th day of June 1974, a kid that would be named Derek Sanderson Jeter was born into the world. His birthplace was in Pequannock Township, New Jersey. He was born into a family with an avid love for baseball. Whether he was with his parents or grandparents, Derek was taken to the games. In school, Jeter’s athletic side became immediately apparent. He became a runner and also played in his high school’s baseball and basketball team. However, all of the baseball exposure he got from home made him tilt more towards baseball. One of his idols while growing up was Yankees player Dave Winfield. Following an amazing high school baseball career, Jeter was offered a scholarship to play college football with the University of Michigan. However, after much deliberations, he forwent his scholarship and turned pro after the New York Yankees drafted him for an $800K contract; that was in 1992. After three years in the Minor League, Jeter made his MLB debut in 1995. Jeter didn’t take long to make his mark on the team as he was named the AL Rookie of the Year in 1996 and also won his first World Series trophy. The rest, as they say, is baseball history. Derek Jeter would probably not be the kind of great player he turned out to be had it not been for the quality of upbringing he had, all thanks to his parents Dorothy and Sanderson Charles Jeter. His mother’s maiden name is Dorothy Connors. She is of English, German, and Irish ancestry. On the other hand, Derek’s father, a doctorate degree holder who works as a substance abuse counselor is an African-American which explains, Jeter’s unique skin color. Dorothy worked as an accountant and met Derek’s father while they both served in the United States Army in Germany. Jeter’s incredible success as an athlete has more to do with having athleticism flowing in his genes than just hard work. His dad played college baseball at the Fisk University in Tennessee as a shortstop. Derek’s parents went the extra mile and instilled a lot of discipline in him as a child by making him sign a yearly contract that included behaviors he should and should not entertain. He was made to take “nothing is impossible” as his mantra. Young Jeter was never allowed to use the word “can’t” and it obviously paid off a great deal. Derek Jeter made a lot of money as a sportsman. His total career earnings (salary alone) was $250 million. Many times during his active years, he appeared on Forbes list of the world’s highest-paid athletes racking up 8-figures in annual earnings. Jeter’s consistency with his game made him one of the most marketable players of his generation. Big brands that clamored for his ink included Ford, Gatorade, VISA, Fleet Bank, Nike, Discovery card and more. According to credible calculations, Derek Jeter earned more from endorsement deals than he did from career salary. Though Derek is now retired, his business acumen has kept his wealth afloat. In the same year he retired, he started a sports website ThePlayersTribune.com which aimed at bringing pro athletes closer to their fans. Jeter owns a Jeter Publishing, an imprint of CBS subsidiary, Simon & Schuster which has longterm goals of producing films and TV shows. Derek’s biggest moneymaker, post-career is his 4% stake in the Miami Marlins. Though he is only a minority owner, Jeter is tasked with the day-to-day running of the franchise as the CEO. A sizable chunk of Jeter’s wealth is tied to real estate as he has several houses scattered all over the nation. His net worth is estimated at $185 million. Derek Jeter is married to the American model, Hannah Davis. They got engaged in early November 2015 and tied the knot on July 9, 2016, in Napa Valley. On August 17, 2017, they welcomed their first child, a daughter they named Bella Raine Jeter. Jeter’s wife Hannah Davis, born on May 5, 1990, in St. Thomas, U.S. Virgin Islands is best known for her appearances on the Sports Illustrated Swimsuit Issue. Other brands she has repped include; Ralph Lauren, Victoria’s Secret, Tommy Hilfiger, American Eagle Outfitters and more. She has played tennis since she was 8 years old. On TV, you can catch her hosting Project Runway: Junior on Lifetime. The 6 feet tall and brown-haired model is signed to IMG Models Worldwide. Immediately after Jeter rose to celebrity status in 1996 thanks to his rookie of the year award, he started familiarizing himself with Hollywood and began dating its women, thus making him a tabloid fodder. His relationship with singer-songwriter Mariah Carey which lasted for roughly a year from 1997 to 1998 attracted much media attention. He went on to date popular women like model Vida Guerra, former Miss Universe Lara Dutta, television personality Vanessa Minnillo, singer Joy Enriquez, as well as actresses like Jordana Brewster, Jessica Biel, and Minka Kelly.